This CD presentation will answer most of the common questions about home schooling. •	Is homeschooling the right thing for our family? •	Why do people home school? •	Will my kids be able to get into college some day? •	How much education do I need to teach my own children? •	How do I handle objections from family and friends? •	How much time is required to home school? •	What if I have several children to home school? •	How hard is the task? •	Where do I find curriculum? •	Where do I find support? 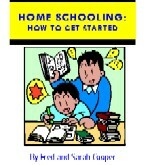 •	What are the different ways of home schooling? •	Where do you do home schooling? •	How do I get started? A $12.95 value -- FREE for a limited time only with a purchase of $39.00 or more if you request it.